This blog post is adapted from a live video I recorded about Pinterest marketing for my private Facebook community. Want to become a member? Scroll to the bottom of this post to find out how. A crucial component of an effective Pinterest marketing strategy is designing pins that promote your content and capture a user’s attention. Let’s look at the ins-and-outs of pin design; I’ll show you just what you need to pull your target audience in — no graphic design skills required! The dimensions you use for pins are important. 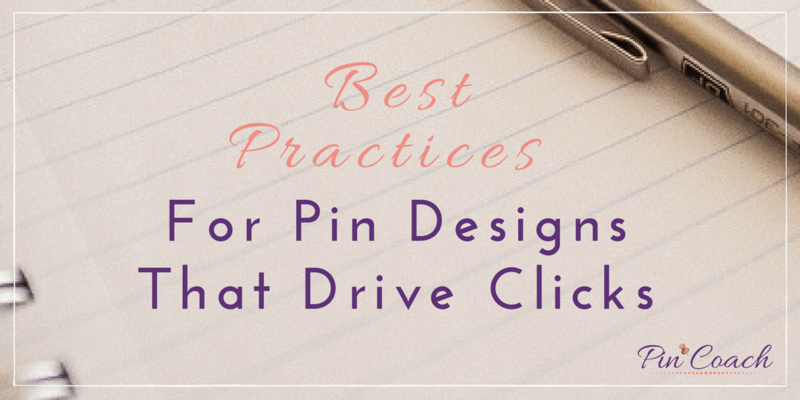 I use Canva when I design images for my VIP clients, and Canva has a Pinterest pre-set feature that automatically generates preferred dimensions for pins. I personally prefer to use the custom dimensions tool for designing pins. The general rule of thumb for dimensions is 735 x 1100 pixels, with the absolute minimum size for a pin that you want promoted being 600 x 900 pixels. Landscape styles and square shaped images typically used on Instagram don’t get as much engagement as tall images on Pinterest. If you want to include multiple images in one longer style pin, you can stack horizontal images over each other for a maximum height of 1500 pixels while still keeping the width about 735 pixels. Pinterest recently rolled out its Lens feature where people can take a picture on their phone and find pins with similar objects in the images, making the need for high resolution photos even more important. Not only should you be using high resolution photos for the sake of their pleasing aesthetic, but the Pinterest team has even said that it prefers to show high resolution pictures over those of lower quality. A good majority of Pinterest users are viewing their feeds from mobile devices with smaller displays. However, when someone opens up a pin, the image enlarges and should be clear and high quality. Great image alone don’t necessarily lead to a viral pin. It’s important to describe what’s in the picture or what it links to using text overlay. This way users know exactly what they’ll be getting when they click on your pin and navigate to your website. Statistically, images with text overlay have more engagement than those without it, and design tools like Canva make this super easy to implement. Text displayed over pin images should include big letters, easy to read fonts (sans serif type fonts are best), and should stand out by contrasting with the image or background. Most people scan through their feeds quickly, so you want your text to be easily processed and eye-catching. For even stronger pins, read my blog post on how to get Rich Pins for your Pinterest account. For highly noticeable text overlay, you can insert a plain colored shape behind your text or enter the text into a section of the pin with a solid colored background. Use colors in the text that match or complement those in the image. You don’t need to be a graphic designer to implement an effective pin design. Take a look in your feed and see what stands out to you. You could even make a secret board for inspiration and to track what pins caught your eye. These are the kind of graphics you want to emulate. Longer pins receive a lot of attention on Pinterest, so these are a go-to if you have multiple photos you could include in your pin design. Simply stack a few horizontal images on top of each other to create one tall pin (see preset layouts in Canva to achieve this easily). This method can amplify the amount of engagement and clicks on your pin. Pinterest is a place where people want to plan for their own future and get inspiration for their projects and activities. They want to see themselves in the pin, which is more difficult to visualize when you see someone else’s face engaging in said activities. So, avoid using faces in your pin images. 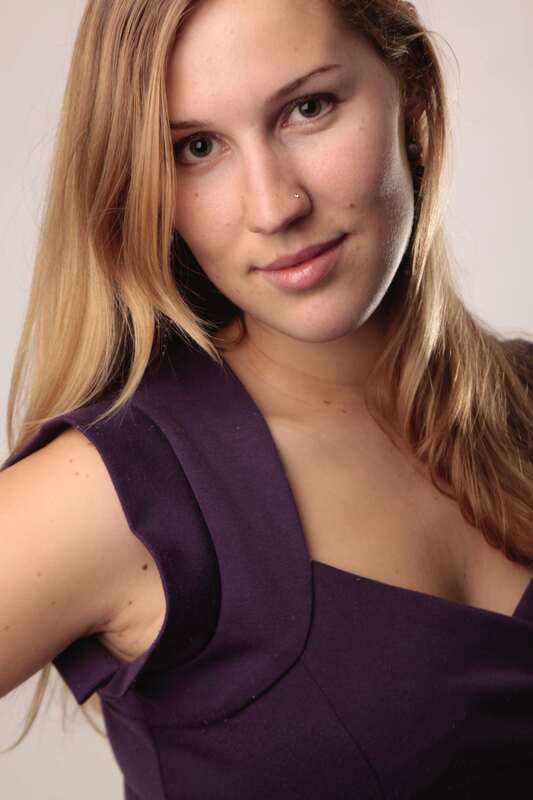 Instead, opt for back-of-the-head images or crop photos to show the neck down (especially in clothing or style pins). What about personal brands? Well, it could be different if you are trying to promote your personal brand on Pinterest and thus want to include your face in pin images, but statistically, pins without faces get more engagement. Another statistic (that actually baffles me) is that red and orange colored pin images do much better statistically than those with blues and purples. This isn’t to say that your images with cold colors couldn’t receive great amounts of attention. However, if you’re trying to follow the data, go for warmer colors like reds and oranges when designing your pins. If you’ve read any of my previous posts, you know I love Canva. 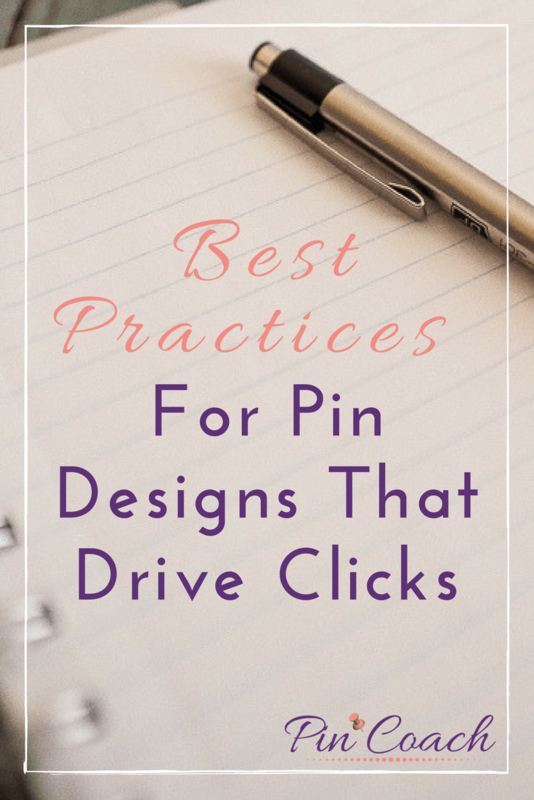 So, what would an article about effective pin design be without a Canva-specific hack? When downloading your pin image from Canva to be uploaded onto Pinterest or your site, download it in .png format. Do not download in .jpeg “for web” format, as the quality just isn’t as good once you enlarge a pin image. If you want to make your downloaded .png image smaller to save on load time, you can use a site like tinypng.com to resize the image while still retaining its high quality. When it comes to designing your own pins, see what inspires you on Pinterest. The options are endless. Using these tips and a little inspo, you are bound to find the design style that fits your brand’s unique message. Beat the Learning Curve – join my community! Want to learn more about how to optimize your Pinterest and generate actionable leads? Download my free Pinterest Checklist for Shopify and E-commerce Entrepreneurs and get a special invitation to join my exclusive Facebook group where you can get the latest updates on Pinterest strategy and community support as you delve into the profitable world of Pinterest marketing!